You'll be £16.99 closer to your next £10.00 credit when you purchase The Courage of Cowards. What's this? An innovative new history of conscientious objectors during the First World War. Drawing on previously unpublished archive material, Karyn Burnham reconstructs the personal stories of several men who refused to fight, bringing the reader face-to-face with their varied, often brutal, experiences. As seen in the Northern Echo, Ilkley Gazette, Ripon Gazette, Wetherby News, Kent & Sussex Courier and Bradford Telegraph & Argus. Also seen in Essence and Discover Your History magazines. As seen in the Manchester Evening News. A welcome telling of the stories of the men who felt compelled not to fight. While the 100th anniversary of the start of the Great War focusses minds on the men who served, it should never be forgotten that there were those who endured many years of being pilloried, imprisonment and even death. Using the techniques of fiction writing, Burnham cleverly and movingly reconstructs the personal stories of several men who refused to fight, bringing the reader face-to-face with the varied, often brutal, consequences of their action. A fascinating untold story of the First World War. The Great War did not just take place on the battlefield and the events on the home front are sometimes overshadowed by the big battles. Not every man was a soldier either and for many military service was a matter of concious – and this new book looks at the untold stories of First World War concious objectors. It covers a wide range of subjects for the terrible treatment some of them received to those who served in the Non Combatant Corps and Friends Ambulance Units. It is a very readable and accessible book with some good first hand accounts from COs and for anyone who is unfamiliar with the subject it is a very good introduction. Simon Fowler, author of Tracing Your First World War Ancestors. Told in an accessible and immediate style without sentimentalising the facts. Karyn Burnham lives in North Yorkshire and gave up full time work a few years ago to concentrate on writing. 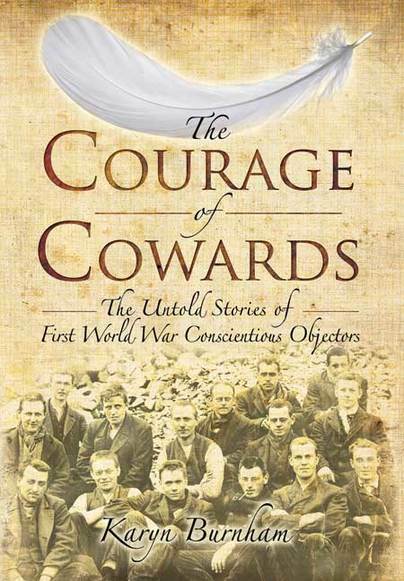 Since then, she has written The Courage of Cowards: The Untold Stories of First World War Conscientious Objectors, published in 2014 by Pen and Sword Books and has also written for several national magazines and contributed articles to history websites.